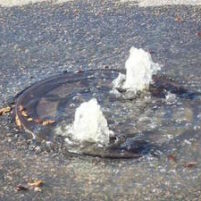 At about 2:30 a.m. on Thursday, 15,000 gallons of sewage spilled from a manhole cover near 81 Broad Street, according to the San Luis Obispo County Public Health Department. The sewage then flowed into Old Garden Creek. The sewage release was the result of a storm surge overwhelming the sewer system. Shortly afterwards, County staffers contained the sewage spill and cleaned up the area. For 72 hours following the storm event, health officials are advising the public to avoid contact with water from the creek. Signs have been posted at the Broad Street Community Garden to warn the public. On Wednesday, 3,000 gallons of raw sewage spilled onto Broad Street.The sewage then flowed into an adjacent storm drain that leads to Acacia Creek. County health officials are asking people to avoid contact with Acacia Creek for the next 72 hours because of increased bacteria levels. Representatives from the County of San Luis Obispo Environmental Health have posted signs at the Damon Garcia soccer fields advising the public to avoid contact with Acacia Creek until Saturday. Such a conscious green county. Might as well make things run green or brown all around! Can’t stop now. Gotta go for the record. Is Wallace the utilities director/engineer/administrator/hmfic now or what?